Generally, it isn’t a good idea to pick a fight with a world-famous sharpshooter. William Randolph Hearst and his editors found this out the hard way when they ran a story that said the already-legendary Annie Oakley was a drug addict and a thief. But Oakley did not reach for her rifle. She took Hearst to court, along with many other newspapers that picked up the story. She wanted to clear her good name. If what you know about Annie Oakley comes from the musical Annie Get Your Gun, forget most of it. Oakley learned to shoot as a young girl in Darke County, Ohio, because she needed to put food on the table for her impoverished family. Her skill with a firearm was soon noticed, and she went up against one of the leading marksmen of the day, Frank Butler, and she outshot him. They married and toured the country as a marksmanship act. He became her manager. From the time she became a star of Buffalo Bill’s Wild West in 1885, she was nationally famous. But although Oakley was called Little Sure Shot and The Princess of the West, she was a demure, married, proper Victorian lady who always went by Mrs. Frank Butler or Annie Butler in her private life. She sewed her own costumes and although they showed her ankles and some of her lower leg, they were modest by show business standards. The truth was that a burlesque performer who went by the stage name "Any Oakley" had been arrested for theft and imprisoned in Chicago. Hearst’s papers claimed that the woman was destitute because of her drug habit, and was 28 but looked like 40. 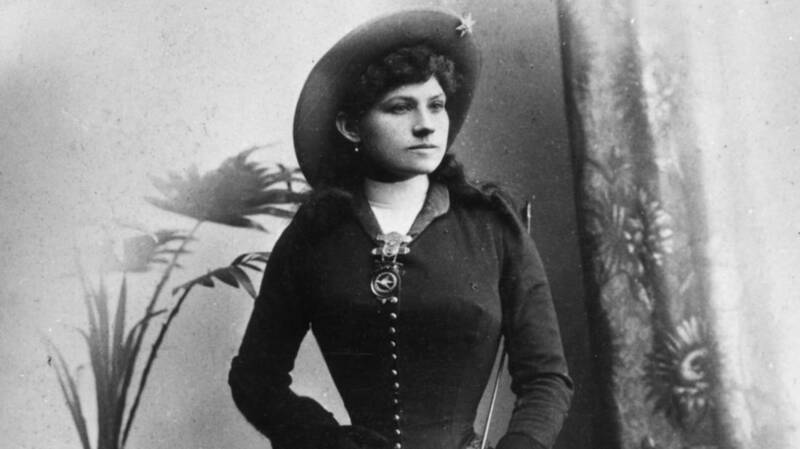 In reality, the gunslinger Annie Oakley was in her early 40s and was hale, healthy, and still quite attractive. The fact that the arrested woman wasn’t the real Annie Oakley was ignored by Hearst’s editors and the story ran. It was picked up by dozens of newspapers across the country. The real Oakley was furious. "The terrible piece...nearly killed me," she recalled. "The only thing that kept me alive was the desire to purge my character." And purge her character, she did. Oakley started by announcing that the Chicago woman (whose real name was Maude Fontenella) was not her and that the whole story was utterly untrue. Many newspapers published retractions immediately. However, Hearst doubled down. He even sent investigators to Ohio to try to dig up dirt on Oakley. They found absolutely nothing that could be used against her. Oakley did not stop with asking for retractions. She sued 55 newspapers for libel in one of the largest libel actions in U.S history. The first case came to court in 1904 and the last one was finally finished in 1910, but Oakley would not back down no matter how long it took. She crisscrossed the country to testify in her own behalf. She took the stand and stared down defense lawyers who tried to hold her show business career against her. They accused her of bringing the lawsuits only for their publicity value and of immodest performances on stage. Despite the provocations, she remained calm and ladylike on the stand. Of the 55 libel suits that Oakley brought, she won or settled in 54 of them. She won $27,500 from Hearst’s newspapers, and between $250,000 and $800,000 all told, depending on who is doing the estimating. Despite winning virtually every case, Oakley lost money. But she got what she was aiming for: getting her good name back. Oakley continued to perform off and on for the rest of her life and even offered to raise "a regiment of women sharpshooters" to help fight World War I. She died in 1926 at the age of 66. Her ever-supportive husband, Frank Butler, died 18 days later.